Ferrari. Linguini. Stradivari. Olive Garden. All things for which we owe Italy a debt of gratitude. Okay…maybe not the last one. I’ve been familiar with the Italian company Bogaro & Clemente for a while, primarily admiring their fittings (pegs, tailpieces, chinrests, endpins) that came in a number of beautiful and exotic woods. I recently needed to order two sets of cello fittings made from pernambuco and took some time to poke around their website. Several friends of mine raved about their double violin case and I wondered what their standard cases were like. 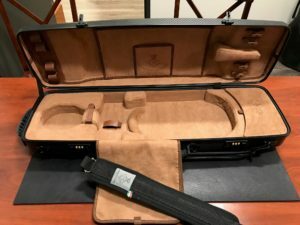 I ordered their “Nicole” violin case in matte carbon with a music pouch, shoulder strap, and a few interior options…hoping that the case was as fine as their fittings. I’m pleased to say it is! This is one of the most beautiful and practical cases I’ve seen in some time. It is thoughtfully laid out, intelligently constructed, and has features most violinists will appreciate. I already have someone interested in this case, but feel free to call to schedule a time to look it over. It can be ordered with so many custom finishes and features, you’ll probably want to spec out your own. We’re here to help!